2014-11-16 Manual updated with boot loading instructions and how to resolve possible Windows driver issues. 2014-03-09 Got Optiboot working on board, see manual for details. 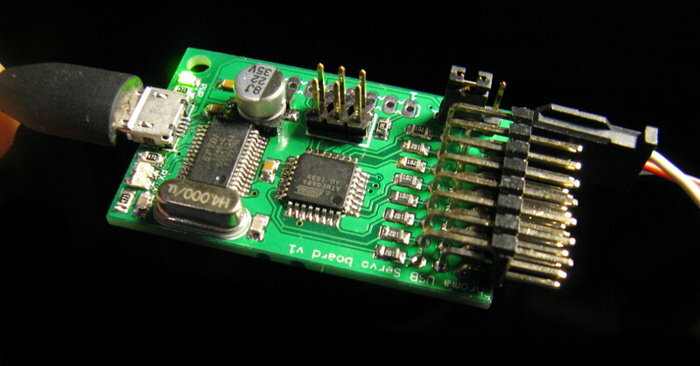 It's a small board that connects to a Raspberry Pi or PC/MAC and allows you to control up to eight RC servos (or ESCs) via an USB serialport. The commands are simple ASCII. Of course this SW will also be open source. The serial ASCII protocol is the same as for the other servo boards. The card also has a 8 pin connector (unmounted) that exposes 6 GPIO-pins of the ATmega8 CPU, +5V and GND. There are experimental support to use them as as digital output controlled via a serial command. If you want to make your own firmware the pins is also the ATmega8s I2C lines (2 pins) and SPI (4 pins). $20 for a complete card. Postage to Sweden is $1, Europe and rest of the world is $2. 2013-05-07 Example C-code to drive the servo board from RPi. If you find bugs or want special features, please send me an email!